But this value trap does have one big thing going for it. Shares of Gilead Sciences (NASDAQ:GILD) are trading at levels last seen in the first half of 2014, when trailing-12-month revenue and earnings were substantially lower than they are today. Investors have punished the company for dropping sales as its hepatitis C franchise faces pricing pressure, and fewer patients starting therapy after the initial group of patients waiting for its treatments were treated and cured. The drop in price has produced valuation metrics that make Gilead look very cheap. Here are three numbers that make Gilead look like a buy -- until you realize there's more to it than meets the eye. 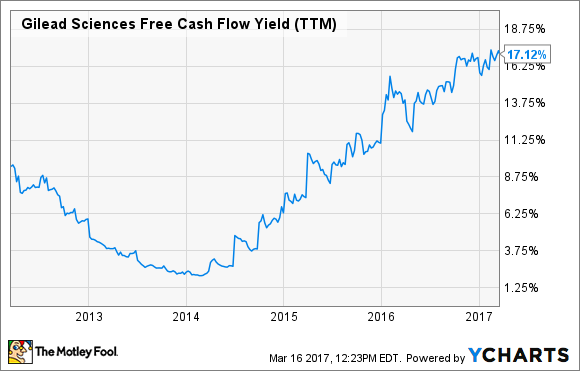 A free cash flow yield that high is amazing considering its peers. Biogen's free cash flow yield is at 6.2%. Celgene's is only 3.7%. Put another way, if Gilead could keep generating cash at its current rate, the company would generate cash equal to its $89.5 billion market cap in a little over five years. Of course, that's a trailing-12-month number, which would only be relevant if Gilead's cash flow was stable. Management doesn't give free cash flow estimates -- or even earnings estimates, for that matter -- but it's predicting that sales will fall from $32.15 billion last year to only $22.5 billion to $24.5 billion in 2017. The economy of scale that's helped Gilead grow earnings and cash flow faster than revenue as its hepatitis C drugs ramped up should have the opposite effect with earnings and cash flow declining faster than the revenue decline. This number is based on 2017 expectations from analysts; they've had a hard time predicting Gilead's results during the decline, but at least it's forward-looking. A P/E of 8.3 based on expected 2017 earnings looks like a really good deal -- most drugmakers would be considered cheap with a trailing-12-month P/E of 8.3, let alone a forward one -- but it still might not be cheap enough. For one, Gilead needs to hit analysts' expectations, but even if it does, a now trailing P/E of 8.3 -- assuming the share price stays the same -- might not be considered cheap since the average analyst is predicting an 8.6% decrease in earnings between 2017 and 2018. Again, this is a somewhat forward-looking number based on the first-quarter dividend, which was increased to $0.52 per share. Even with the aforementioned decline in free cash flow, it appears Gilead will have no problem paying a dividend at that level and the biotech can probably even increase it next year. On a trailing-12-month basis, Gilead's dividend payout ratio was just 18%, giving it plenty of wiggle room. For many companies, a dividend can offer support to the share price. As the share price drops, dividend investors will swoop in for the higher dividend yield. But, as I pointed out in a previous article, Pfizer's dividend yield got above 10% as the Lipitor revenue cliff approached. 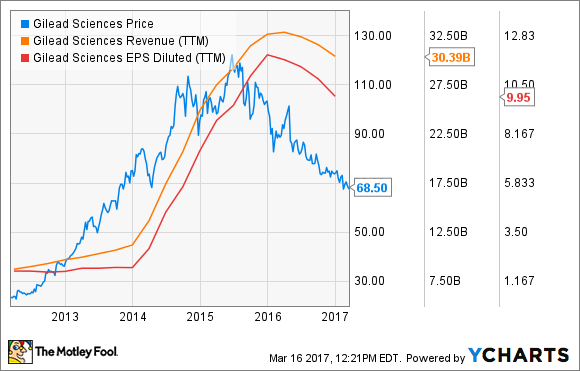 Gilead has a long way to go -- either increasing the dividend or lowering the stock price -- before it would be at that level. While the current valuation metrics make Gilead look like a value trap, the biotech does have one thing going for it: cash. The company ended 2016 with $32.4 billion in the bank, which provides quite a bit of firepower to drive external growth through acquisitions. Gilead has essentially zero growth built into the valuation, so if the company can stabilize its hepatitis C drug sales and produce revenue growth through acquisitions, the share price should rise accordingly. How long that'll take is anyone's guess, but investors can continue to collect their dividend while they wait for potential better times ahead.